Instructions for adding the Order Printer Pro automated PDF link to an email, so customers can download receipts / invoices themselves. NOTE: These instructions are only relevant if you already have the Order Printer Pro app setup in your Shopify store. Our Order Printer Pro app allows you to add links to your Shopify emails, so that customers can download a PDF of their receipts and invoice automatically. When a customer clicks the invoice link in your email, Order Printer Pro will provide them with the PDF invoice you have setup. This saves you time by providing customers with an invoice automatically, reducing the manual requests you receive asking for invoices. It also saves paper and ink, so it's highly recommended. Install and setup the Order Printer Pro app, then click "Setup PDF link" on your template in that app. Complete Step 1 of the PDF setup wizard in Order Printer Pro. Skip Step 2, which requires you to manually copy/paste the pdf link code into your emails. In the email type dropdown, select the email that you would like to add the invoice link to, for example, the Shipping confirmation email. You can also drag the button section in the list of sections to move it's position in the email. 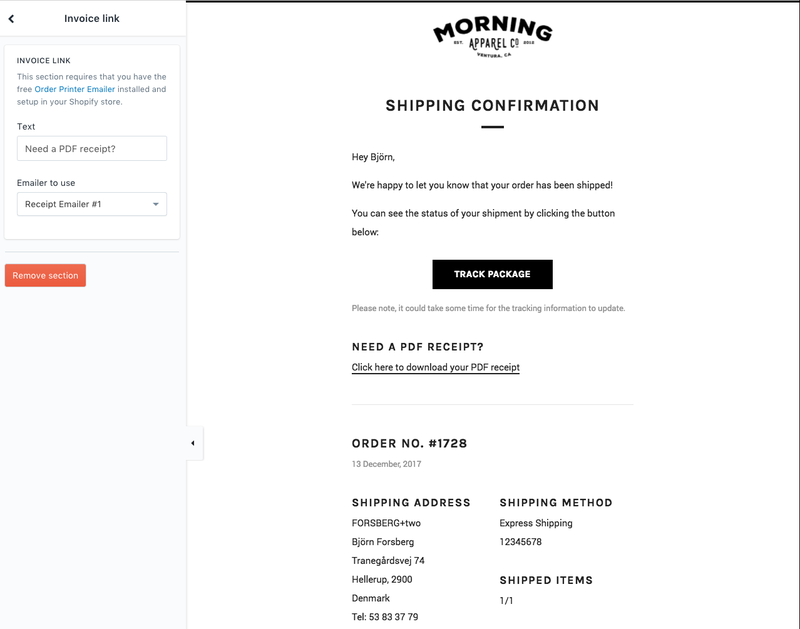 If you are updating an existing email that you have previously purchased, make sure to click the Finished button and copy/paste the new email template code into the Shopify admin again.